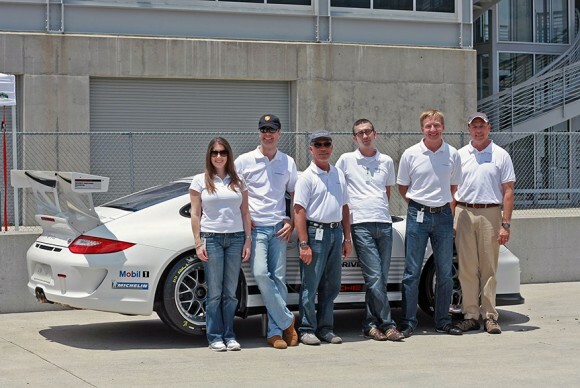 Porsche Cars North America is entering a 911 GT3 Cup race car and dispatching six employees to the inaugural Porsche Carrera World Cup race, which is held during the same weekend as the 39th ADAC 24 Hours of Nürburgring Race in Germany, June 25, 2011. The team will document and share all the off and on-track excitement on the "The Hub", Porsche Cars North America’s new social media press site. Held prior to the start of the 39th ADAC 24 Hour Race, the Porsche Carrera World Cup will pit up to 200 competitors and their Porsche 911 GT3 Cup racers against each other and the Nürburgring Nordschleife. When American Le Mans Series (ALMS) GTC Champion Melanie Snow joins the other Porsche 911 GT3 Cup racers on the starting grid at 10:30 am local time, at Germany’s legendary Nürburgring on June 25, she’ll not only have a unique ground support crew; she is slated to be the only female racer to compete in the Carrera World Cup. Following the Porsche Carrera World Cup race, Porsche takes on the Nürburgring 24-hour race with the latest-generation 911 GT3 R Hybrid. ‘Version 2.0’ features a flywheel accumulator hybrid system that is 20 percent lighter than last year; a weight saving that targets the same lap times as its predecessor, but with even less fuel consumption, resulting in fewer pit stops for fuel. The general layout of the hybrid engine remains the same; however, the output of the electric motors increases from 60 to 75 kilowatts each, or from approximately 80 to 100 horsepower per motor. Driving the 911 GT3 R Hybrid 2.0, will be Patrick Long (USA), Richard Lietz (AUS) and Marco Holzer (GER). The trio claimed the first win for the 911 GT3 R Hybrid 2.0 at the VLN 4-hour Nürburgring Long Distance Championship on May 30.